Blue Suede News #49: Narvel Felts, Gary Bryant, Bobby Lowell, Josie Kreuzer, R.L. Burnside, Paul Rishell and Annie Raines, Joe bennet and The Sparkletones, Rockabilly, Blues, '50s Rock'n'Roll! Issue #49 - Winter 1999/2000 - Scroll down to order!! 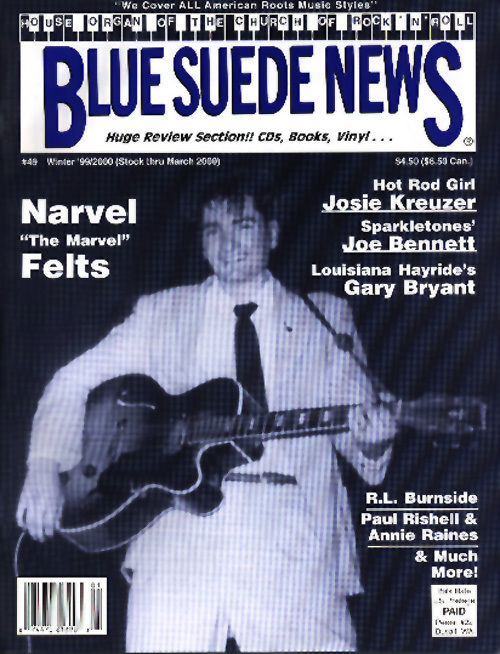 Blues Suede News #49 has many feature articles including one on Sun Rockabilly legend and country superstar Narvel Felts and longtime Louisiana Hayride regular Gary Bryant with cool vintage photos. Obscure Rockabilly rebel Bobby Lowell is featured with a story and lovely current Rockabilly singer and Hot Rod Girl Josie Kreuzer. On the blues side we get an interview with R.L. Burnside and a story on Paul Rishell and Annie Raines. Also included is a story on Joe Bennett & The Sparkletones, another '50s Rock'n'Roll act. You can purchase this issue securely online now! OR you can order the digital version in PDF form e-mailed to you for $7.50! Click here for PDF please note which issue you're ordering with the payment! You'll see issue #45, but can order other 68 page issues from that same page (#35 - #56 - #56 is 60 pages).